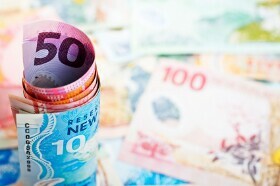 The most important domestic event for the currency of New Zealand should be New Zealand’s Consumer Price Index due for release overnight between Tuesday and Wednesday. Analysts had estimated ahead of the report that quarterly consumer inflation accelerated to 0.3% in the first three months of this year from 0.1% in the last three months of the previous year. Another relatively important event should be the release of Global Dairy Trade Price Index on Tuesday. Milk and dairy products are an important source of nation’s export revenue, therefore dairy prices tend to have noticeable impact on the New Zealand currency. During the past reporting period, prices rose by 0.8%. Outside of New Zealand, macroeconomic releases in China, New Zealand’s biggest trading partner, should affect the kiwi. The vast majority of this week’s releases in China will happen on Wednesday, and the most important of them should be a GDP report. Analysts predicted that it will show an annual growth of 6.3% in the first quarter of 2019, down from 6.4 in the fourth quarter of 2018. Events that affect the Forex market in general, like the Sino-US trade talks, can influence the New Zealand dollar too.